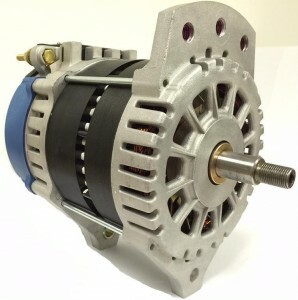 Since market introduction in mid-2002, patented Eco-Tech high amp Alternators have been installed and used successfully by both original equipment and aftermarket fleet operators. 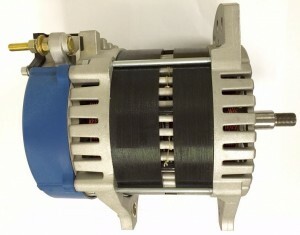 Eco-Tech Alternators provide superior high output at idle performance (80% of rated output at idle) and unmatched efficiency, which has been experienced in diesel powered military boats; fire trucks; ambulances; utility company bucket trucks; school, shuttle and party buses; commercial fishing boats, and other applications where significant operating time at idle occurs at low engine speeds. 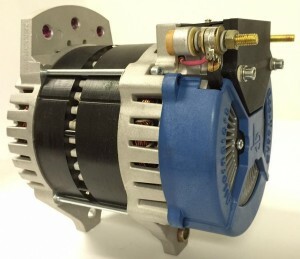 The J-28V/200-I Alternator is a replacement for J-180 mount alternators that have a center-to-center measurement of 8.5” between the drive end pivot hole and the threaded adjusting hole. The J-28V/200-I Alternator has the standard measurement of 4” between the pivot ears. 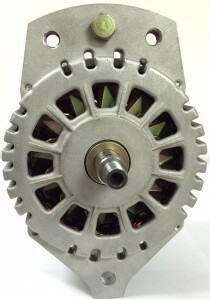 Eco-Tech 28V 200A alternators generate 145A (80% of rated full output) at 1,800 alternator RPM’s which is engine idle. 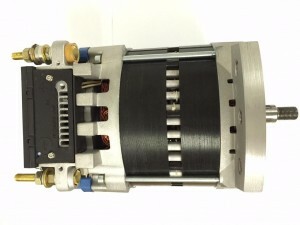 Idle output is about 2 and 1/2 times the output of similar size claw pole (Lundell) alternators.